Whilst knife crime remains low in Surrey – much of what does take place is related to drugs and gang activity, some of which spills over the border from London. Sadly we have continued to see the devastating effect knife crime has on people’s lives both across the country and in recent months here in Surrey. The Force is working hard to prevent the threat of ‘county lines’ gangs who are using vulnerable people in local towns to spread their supply network. Superintendent Peter Fulton, Force Lead for Violent Crime said: “In the last week alone, a man who subjected two boys to knifepoint robberies in Leatherhead is finally behind bars after an appeal against his original sentence. James Quinn from Dorking, aged 19 at the time, was one of three offenders who targeted young victims, aged just 11 and 15 years, using a knife to threaten them and take personal possessions from them. “Following the robberies on January 27, 2018, Quinn was arrested and charged. On 19 January 2019, he was sentenced to two years’ and two months’ imprisonment, which was suspended for two years. He was also ordered to pay compensation costs of £250 to each victim. His co-defendants had previously been sentenced at youth court. “However, the Crown Prosecution Service felt that the sentence handed to Quinn was too lenient and lodged an appeal. As a result the original sentence was quashed and he was jailed for two years and 10 months. 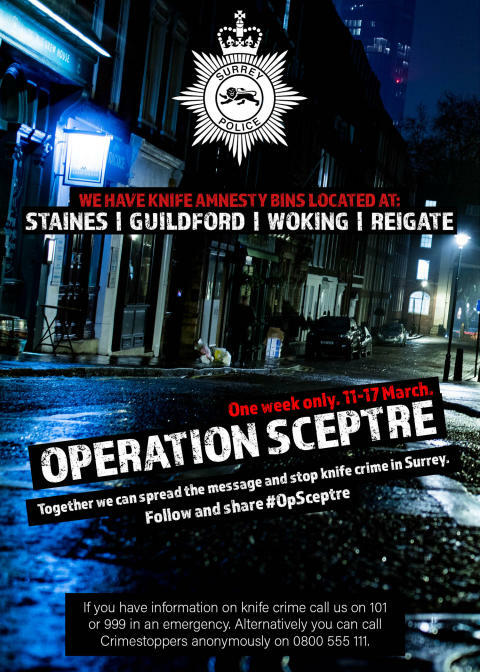 “As part of our #OpSceptre campaign, we are giving people of Surrey the opportunity to surrender their knives or weapons without fear of prosecution or questions being asked for one week only (11-17 March). Knife bins are located at police stations in Staines, Reigate, Guildford and Woking to enable people to give up their weapons safely. Last year in Surrey there were two amnesties which resulted in a total of 166 weapons being handed in. Whilst knife crime remains low in Surrey, it is essential we keep on top of this issue and that’s what makes our participation in this campaign so important. You can help us spread the message and stop knife crime in Surrey too, follow @SurreyPolice and #OpSceptre throughout the week.